For some odd reason, the print on my leggings remind me of that really famous game I used to play on our family computer when I was a kid. You know that arcade game called Galaga, where you have to shoot spaceships and stuff? Yes, believe it or not, I used to play the family computer way before Sega, Nintendo, Play Station and Xbox came out. (Ain’t I full of surprises? Haha!) I’m the youngest of three. I have an older brother and older sister who used to fight over me. Whenever my brother wins, I have to play computer or basketball with him. And when my sister wins, time to whip out the Barbies, Polly Pockets, luto-lutuan (kitchen) and bahay-bahayan (play house). Oh, the life of being the youngest… I was so in demand haha! So anyway, back to what I was saying before I went down memory lane–these leggings are actually tribal-inspired but they somehow register differently in my eyes. Nevertheless, tribal or Galaga-inspired, I love them! The strong contrasting colors make them all the more attention-grabbing. Hi Ms Camille! 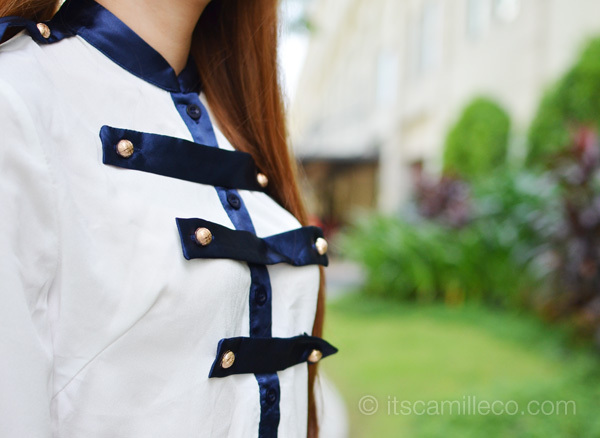 :) I was wondering if this kind of top could still be ordered online, or if it is still available in coexist branches? Thanks! I <3 those red pumps!! I really love your leggings, what brand is it? 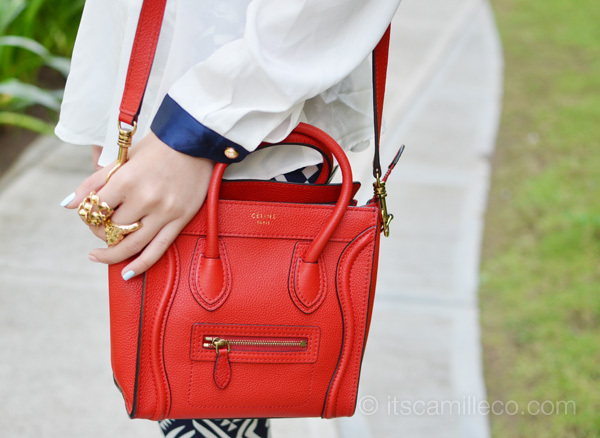 Just want to know where you can get the Celine bag? It’s really pretty! hi, i’m aiming for a celine bag, this one is nano right? and is the color vermillion? Gondaaa!! what is the biggest size for the top? is the fabric partly elastane? Hahaha and so I sang it! Thanks Mars! This outfit is just pure awesomeness *o* !! Your printed pants are amazing!! You look great!! Hi, i want to get the top.. What are the sizes. I want to order online. Thank you! You look gorgeous! Hi Ms. Camille! I really miss reading your blog. Just dropping by to say that you look gorgeous as always. This one looks like a Chinese-soldier-meets-tribal-prints-that-look-like-Galaga, love it. It’s so nice for you to share some of your childhood, your siblings are super sweet! :p Just wondering though, which of them did you like being playmates more? I love everything! Really nice outfit! :) Does the top come in sizes? super pretty!!! Thanks Isa! It’s free size! i want to see you in person. very well coordinated- your legs look amazing! I love the outfit! You look tall in this pic! Haha. Stay pretty! Haha must be the color! :) Thanks Abrilata! I love the print of your leggings! Ah I am the youngest one in my family, I have an older brother and older sister too! I remember the days where we used to fight over small things as well! I don’t think being the youngest is great in our household, my siblings used to gang up on me which wasn’t great haha! Looks like the top and leggings were made for each other. Love your outfit. Plus the bag and shoes. Plus the cute childhood story, binasa ko ng paulet-ulet yung paragraph na yun. Ang cute kasi. Hi I want to buy the top but. I can’t see it in coexist website email me thanks! sooo military esque! love this print on those pants! IDK why, but I really love this outfit of yours, Camille. So wearable! I love the printed leggings with the military style top! Great outfit! I love the red bag :) you look amazing and beautiful!! omg. so darn edgy! totally love how you match the blouse and leggings together. can’t believe something so formal and something so casual can look so good together! I love the prints of your leggings and the red accent of your entire outfit! Haha I love Ateneo! Just make sure you prepare for it. Make a checklist of what to bring so that you don’t forget anything. The night before, just relax and sleep early so that you’re refreshed when you take the exam :) Good luck! Win! I love this look. Great job Camille! Hello! Miss Camille, I just noticed that you really have a fair complexion. What do you use or do to lighten your elbows and knees? Need your help po talaga. They’re my darkest and ugliest features. :( And do you use Garnier for your pimples? Thanks! BTW… I am a new follower. You have great style! soooo love ur style ;))) what is the shade of ur lippies ms. camille? Hi Camille! My curiosity is killing me right now! Argh! Could you please post old photos of you and your family? I don’t why, I’m just very curious. Haha. Do you think you could do that for me? And, I find it really cute that your two siblings are fighting over you! I didn’t imagine you to be the type to play computer games! Btw, another curious question, do you shop every week? Haha hindi naman! :) Thanks Tricia! Camille, this is Min. I sent you email that we would send the copy to your home. I need to send out magazine by tomorrow..would you send your address to me? EHRMAGEHRD!! I LURVE DEES!! XD Children of the 80’s unite!! For me though, I’m thinking more of Space Invaders. Add to that your top somewhat reminds me of The Beatles Sgt. Pepper Album :D Love that pop of red on your shoes. Candy Apple Red!! Hahaha children of the 80s!!!! Space Invaders too!!!! adore that bag!, you look great. I love your top cam.. This is simply gorgeous,Camille!You look so beautiful and the clothes are great. Oh wow! Cool info! :) Thanks Trisha! Love! I wish you’ll carry more Celine bags in the near future! :) I’ve seen a black sequinned top from Coexist. Why are you not wearing them? They’re so pretty! Do you have all your Coexist items in your closet? aawww. your leggings are cool:) I used to play that game too, your top is awesome. Did you design the top? I love your bag and top! Haha I agree! Yay I love Christmas! Ber months na!